I don’t know about you, but I struggle on a daily basis and ask myself this one basic question: what I should eat? I wake up and wonder what I should eat, I get out of class and I wonder what I should eat, I finish practice and ask myself the same thing: what should I eat? There are no exceptions, especially after a night of drinking or late night extravaganza. Countless times in my drunken stupor or sleep depraved body, I’ve struggled to come up with an answer. It wasn’t until many successes and failures (mostly failures) that I’ve found a few gems to go out of my way just to dig my teeth into while intoxicated or starving after a night of studying. 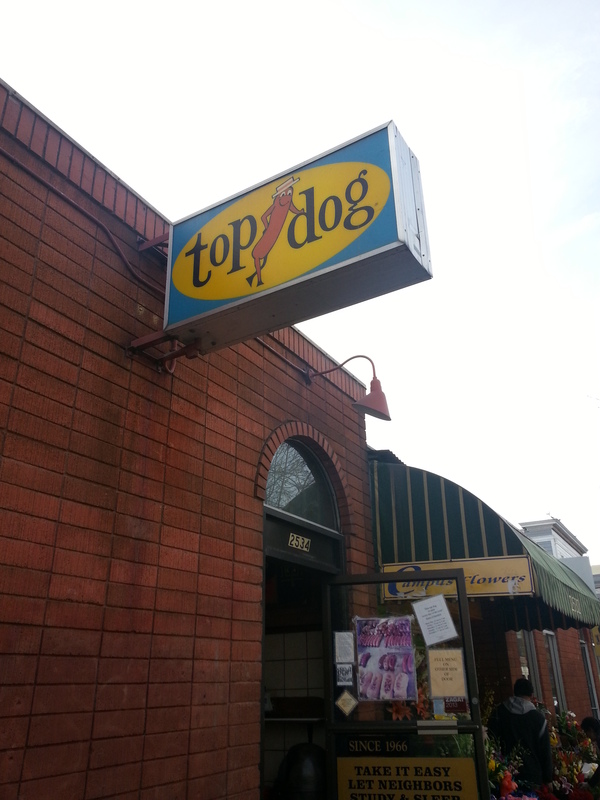 Let me introduce you to one of my favorite Berkeley spots to eat at after midnight: Top Dog. Founded in Berkeley in 1966 conveniently on a football game day, it is located on the lovely Durant ave. between Telegraph and Bowditch, this place is an absolute gold mine after a night out or when you are in need of food at night. This is literally your typical hole in the wall, two doorways leading inside only to see a small space for orders, a counter, and the person behind the counter working the grill. During the day, the place is quite empty, people venturing in every couple of minutes and not as lively. By nightfall, the place transforms into a crowded vegas club with lines usually going up and down the street. 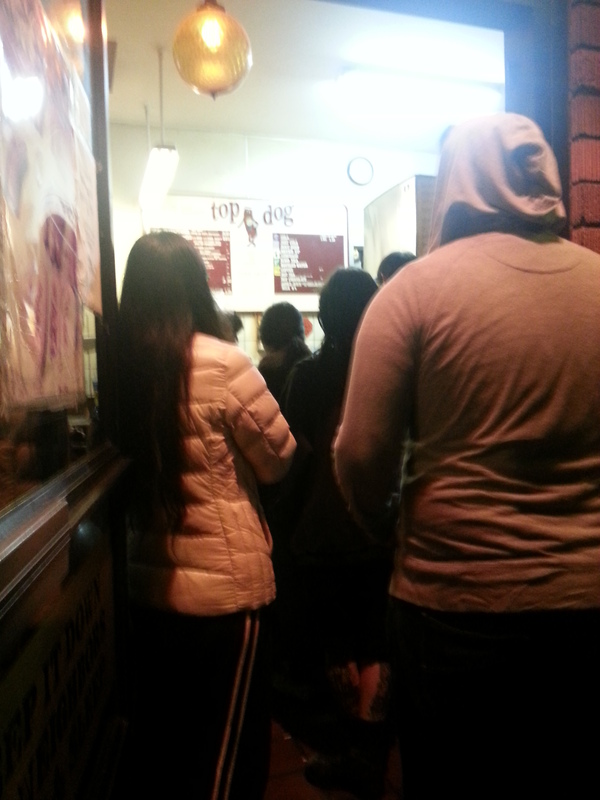 Aside from the humongous line, the place deserves the reputation. 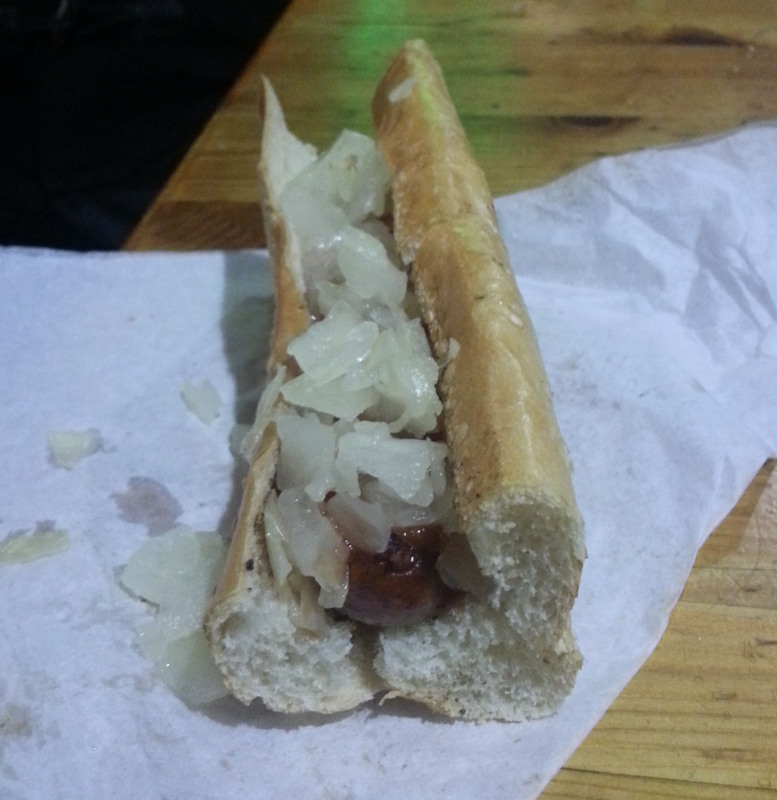 Top dog is not just any hot dog place, it serves quality hot dogs and sausages on a nicely cooked French bread roll that is fresh and perfect for their dogs. My favorites are chicken apple, kielbasa, and bratwurst. The kielbasa has a little kick and the amazing pork flavor any kielbasa lover is looking for. The chicken apple tastes like a nicely cooked chicken sausage with bits of apple for sweetness in between each bite to balance out the meat flavor. The bratwurst has that nice kick you want in a bratwurst and the hearty meaty flavor to it. How can you have your top dog though without your assortment of condiments? Against the wall, you’ll find your self-serve condiment shelf with diced onions, sauerkraut, relish, mustard, hot mustard, and ketchup. My personal favorite is stuffing my hot dog with onions and drizzling the ketchup all over it, but the sauerkraut, relish, and mustard flavors taste fine if that is more up your alley. There are many reasons why I love this place aside from the freshly cooked sausages sizzling in front of you. For one, their staff is awesome. The cooks are always ready to engage in conversation and are not afraid to yell at you for blocking the door, asking for your order, or to smoke farther away from the building. Typically they only have one person working at a time unless it is a Friday and Saturday when they are packed up and down the street. My personal favorite cook is the black dude with dreads. He literally runs the show at the place and has been working there for as long as I can remember. He trains everyone and always has something to say to his customers. He really makes the place lively with his antics, conversation knowledge, and if you are lucky enough, his singing, dancing, and rapping. 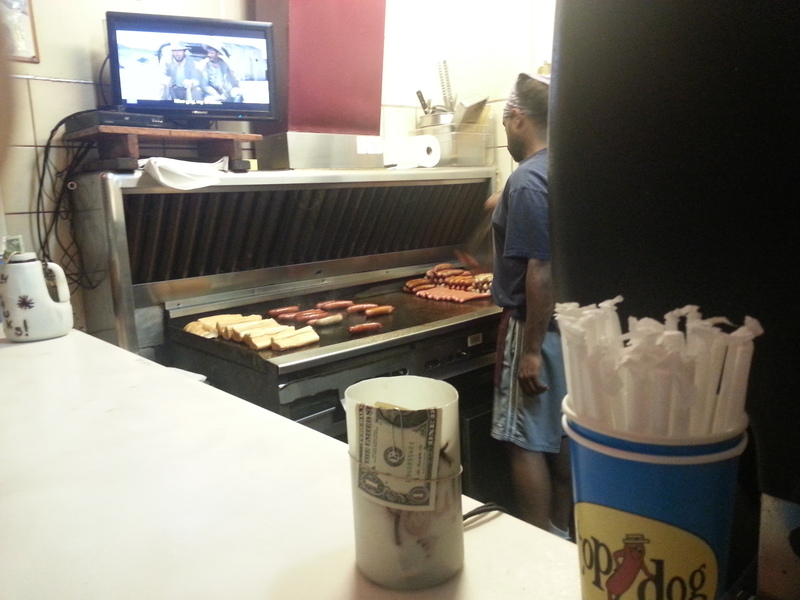 For $3 for a regular top dog (frankfurter) and 3.25 for any other flavor, you are in for a treat after a late night out. Plus you may meet some interesting folks there with all the foot traffic the place draws!